There's been mighty little time for blogging these past few weeks, as I've been hustling and hustling to meet a couple of very tight deadlines. Done and done, so it's time to take a brief breather. 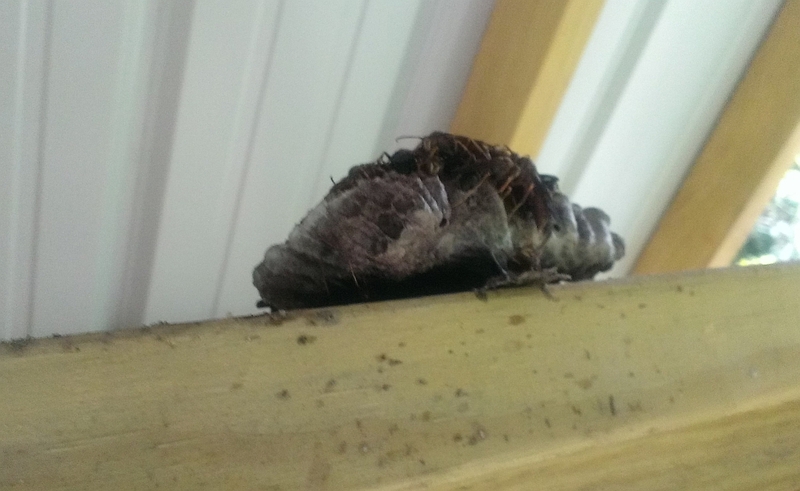 Happily, the results of some of the more recent labors are beginning to manifest themselves. World War Cthulhu, featuring my story, "The Game Changers," is now in release. 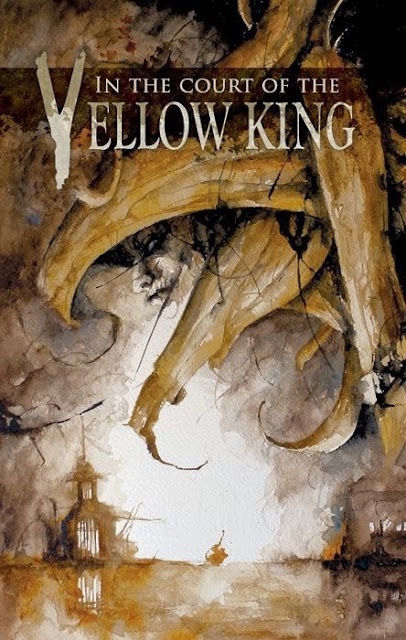 And just on the horizon, from Celaeno Press, In the Court of the Yellow King, featuring "Masque of the Queen," a tale I'm rather proud of. 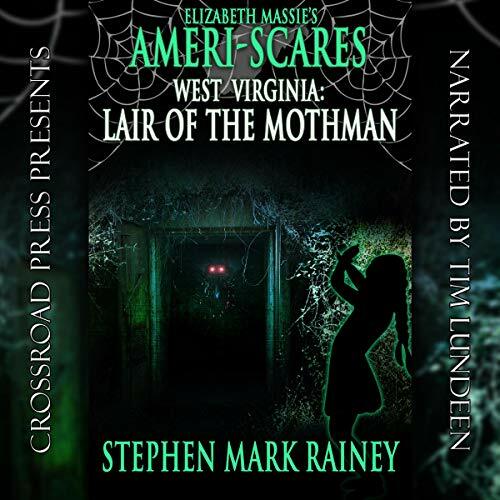 As of last night, I've just completed two new short tales — both on the longer side, actually, near 8,000 words — and submitted them to their respective editors. Tentacles and other appendages are all crossed. On the home front, Droolie and his compadres, Chester and Frazier, have also been working overtime. I wish I'd had the presence of mind to take a photo or two this morning, but I was entirely too busy swearing a blue streak and cleaning the kitchen after a spectacular crockpot demolition. It certainly would have made a dynamic entry in the Designs by Droolie® line, and it has necessitated an altering of dinner plans. Fortunately, Ms. Brugger is quick on the draw when it comes to dinner arrangements. An evening of wine and good company lies ahead, providing the cats haven't demolished the house when I get home this evening. Cash bets only, please. Nothing Says "Boo" Like "Booe"! Saw it once, and I figured it might be a typo on a gravestone. Saw it twice, and I figured it was definitely deliberate. 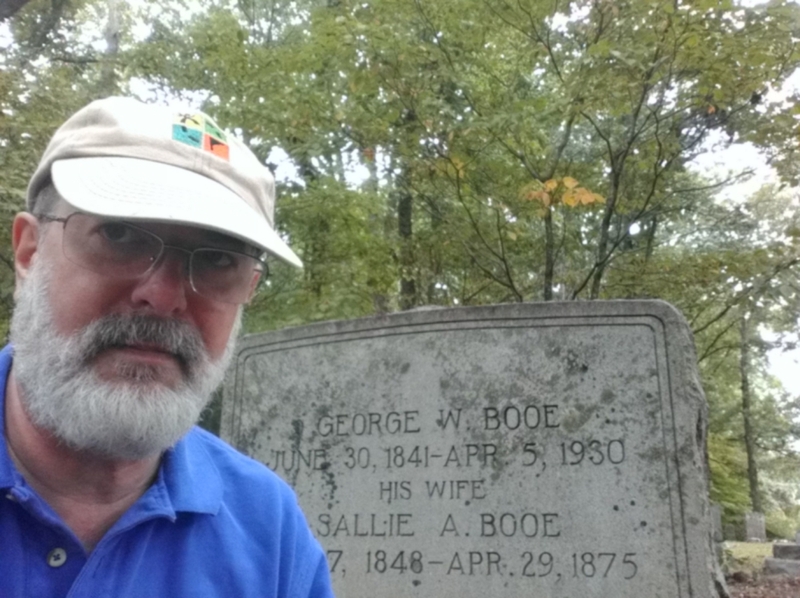 While out geocaching, Rob, Robbin, and I decided to visit the Joppa Cemetery, a little graveyard outside Mocksville, NC, whose most famous inhabitants are surely Daniel Boone's parents, Squire Boone and Sarah Jarman Morgan. A beautiful, serene setting; densely wooded; well-maintained for a relatively old graveyard. But the stones in question read Booe, not Boone. There was even a Daniel Booe. Apparently, the Booe family was fairly prominent in Davie County over a span of many years. 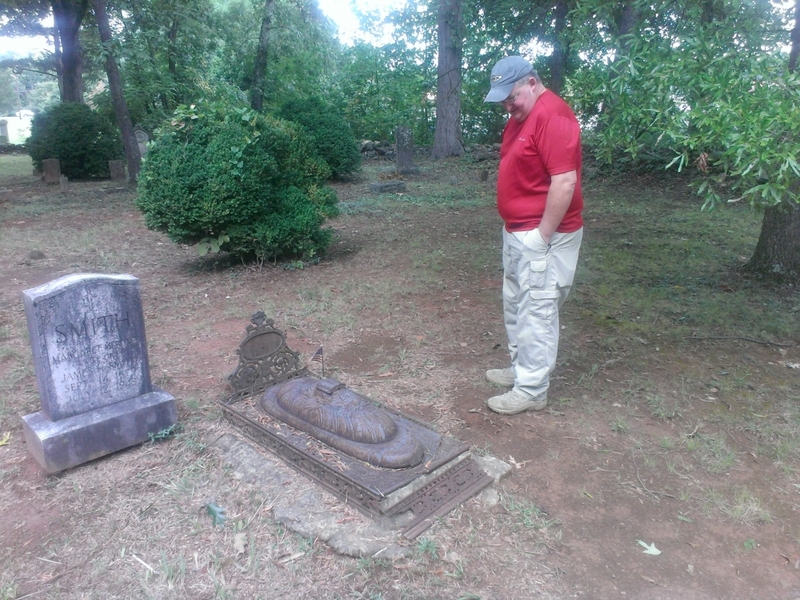 The graves of Daniel Boone's parents, sure enough, were not far away, but happening upon the Booes was a little startling. 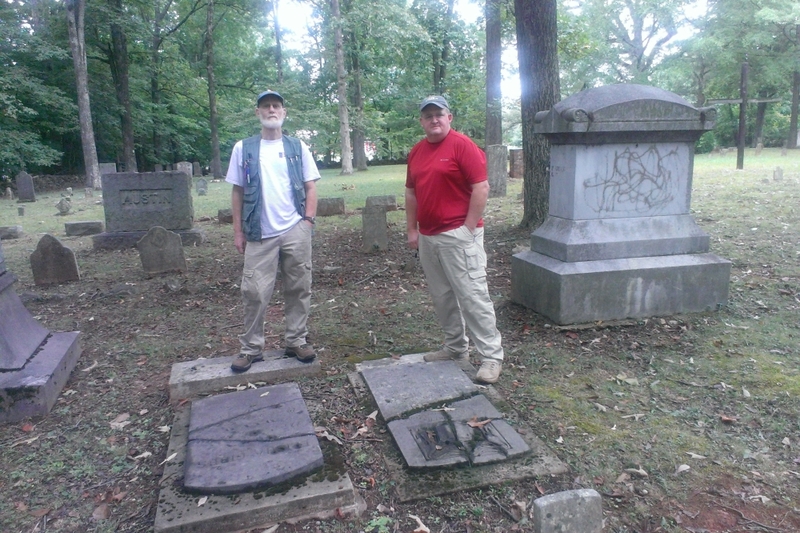 We did find the cache at the cemetery, then moved on to a portion of the relatively new, cache-rich Carolina Thread Trail, a few miles to the northwest. This trail is part of a regional series of trails and greenways that are intended to eventually link together, forming a network that will allow access to locations throughout central North Carolina. This ambitious project is well underway, with dozens of completed trails and many more currently in progress. Great stuff for hikers and cyclists — not to mention geocachers. 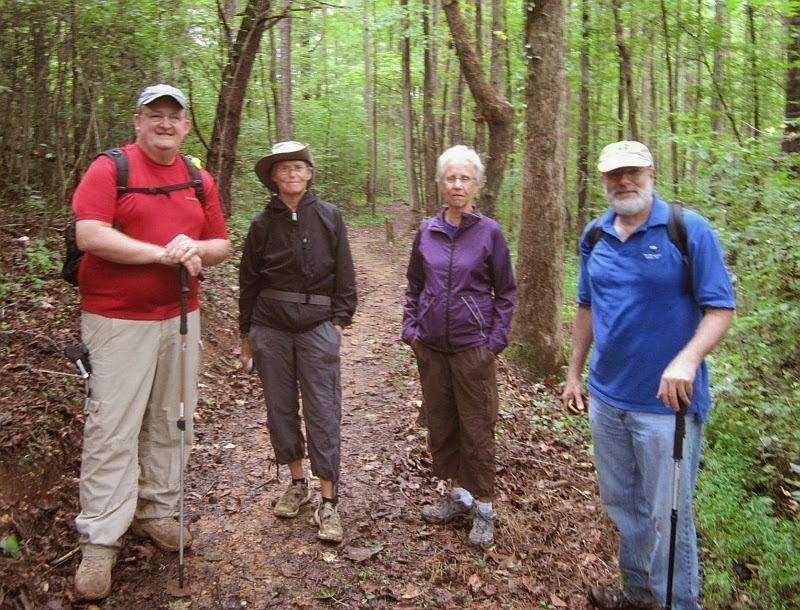 We picked up 16 caches along a 2.2-mile length of trail along the South Yadkin River (Girl Scouts, Hornets' Nest Council Trail), and ended up running into several other geocachers, including our friends Christopher (Ranger Fox), Diana (half of David & Diana), and Phyllis (Liber) from the Piedmont Triad. A fine day of it, indeed. Booe! Scared you, didn't I? If you're an old monster movie buff like me, you might remember the daikaiju movie, Yog — Monster From Space (a.k.a. Space Amoeba) periodically showing up at drive-in theaters in the early 70s, usually on a double feature with Destroy All Monsters or Godzilla vs. the Smog Monster. 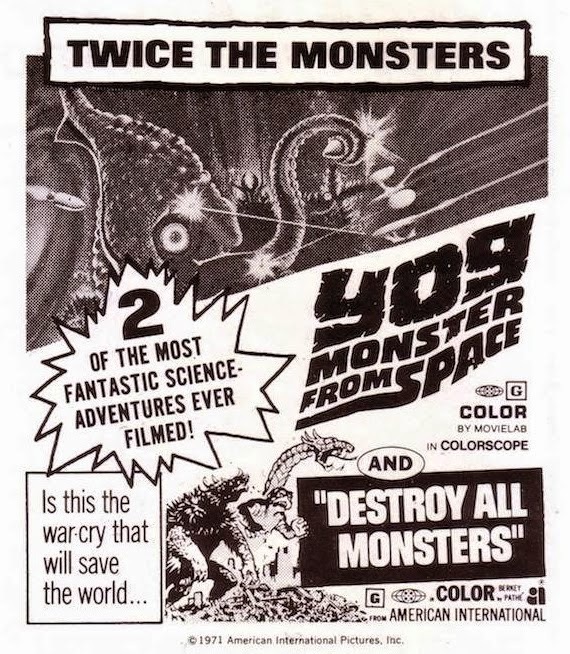 Sure enough, summer of 1973, Destroy All Monsters and Yog were coming to the local drive-in (the Castle, may it R.I.P., in Collinsville, VA), and while my parents didn't mind occasionally taking me and some friends to see monster movies, they inevitably ruled that the second feature came on too late for us to stay up. Well, I wanted to see Destroy All Monsters because it was a Godzilla movie; I knew nothing and cared nothing about Yog. Naturally, according to the published schedule, Yog was to be the first feature. So I called the drive-in, hoping to convince them to run Destroy All Monsters first. No way, they told me; the projector was set up to run Yog first, and that was that. Well, young Mark is distressed. So for a couple of evenings, I called the drive-in relentlessly, disguising my voice, even getting my best friend Frank to call them, hoping to persuade them to run Destroy All Monsters first. Each call was answered with the inevitable "No way." Well, come the weekend, my Dad takes us out there, we stop at the ticket booth, ask which show comes on first, and we're told "Yog, Monster From Space." (The lady pronounced it like "Yoga.") So Dad says, "Sorry boys," and figures we'll want to leave. But no; we put on the pressure and get him to drive us on in, just to see if maybe the ticket lady had made a mistake. Well, since we didn't pay, the manager comes to pay us a visit, and Dad tells him, "We just figured we'd stay for a few minutes to see which movie came on first." The manager bends down and gives Frank and me a very hard stare. "You must be those youngsters who've been calling nonstop for the last two days." We admit that we are. The manager sighs and says, "Well, we've decided to run Destroy All Monsters first." You could hear us whoopin' and hollerin' over in the next county (which was actually just a stone's throw away). So it was a wonderful night for monsters. But had I known Yog was a fun little Toho film, I would have been just as happy to see it, since I'd already seen Destroy All Monsters once before (this goes to show you the value of research first). But, as luck would have it, Yog showed up at the downtown movie theater a few months later, all by its lonesome, so I went and checked it out. It was a blast then, and by gummy it still is. 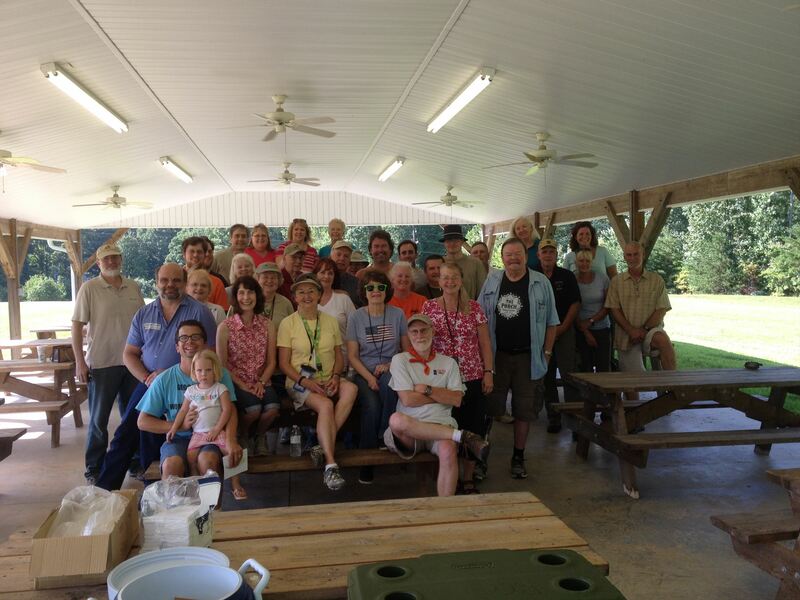 "The Socializer" event in Reidsville — geocachers a-plenty! What does a geocacher do on a long weekend? Go caching like there's no tomorrow, of course. Actually, most of last week I was hard at it on the geocaching trail, taking on several tough and/or otherwise invigorating hides, including a couple of mentally challenging puzzles (for some of us lacking mathematical prowess, "difficult" might be a more apt term), one way up in a great big tree, and a caching event held in Reidsville, hosted by 3Newsomes, a.k.a. Shannon. On Sunday, Robgso (a.k.a Rob) and I cleaned up in Mebane, and, yesterday, Suntigres (a.k.a. Bridget) and Rtmlee (a.k.a. 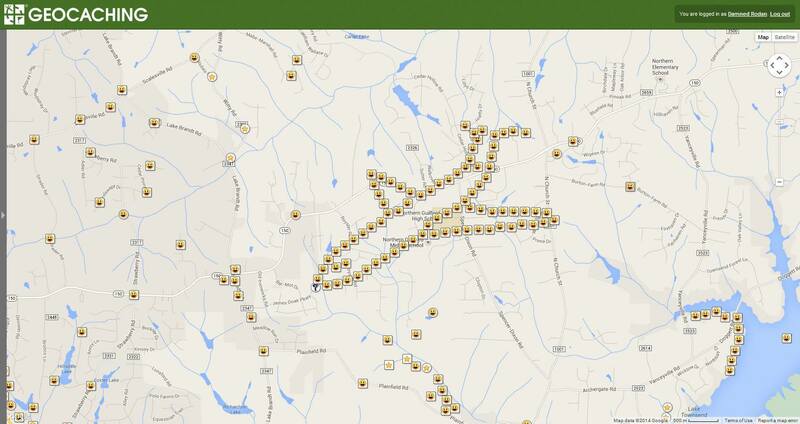 Robbin) made short work of a geoart series called Final Approach, the geoart being the shape of an airplane formed by cache icons on the geocaching.com map. It may be a stretch to call them "perks" from Geocaching.com, but parent company Groundspeak awards virtual tokens, called souvenirs, to geocachers for various accomplishments in the field. For example, last August, you received a souvenir for each day of the month you went caching, and if you logged finds on all 31 days, you received a special "31 Days of Geocaching" souvenir. This year, during the month of August, you received a souvenir for logging the various types of geocaches — i.e., an "Explorer" souvenir for finding a traditional cache, a "Sightseer" souvenir for find a multi-stage cache, a "Nature-Lover" souvenir for attending a cache-in, trash-out event or finding an Earthcache, and so forth and so on. If you logged all six specified types over the course of the month, you received a special "Seven Souvenirs of August" souvenir. Yes, I managed to accomplish this perhaps not-so-astounding feat, but hey, it made for a fun little personal geocaching goal. Kimberly says it does enhance my status as a geek, so I guess I'll just go with that. But, apart from caching, what's a long weekend without a couple of hot dates with Ms. B. and some wine to go with it? No worries! 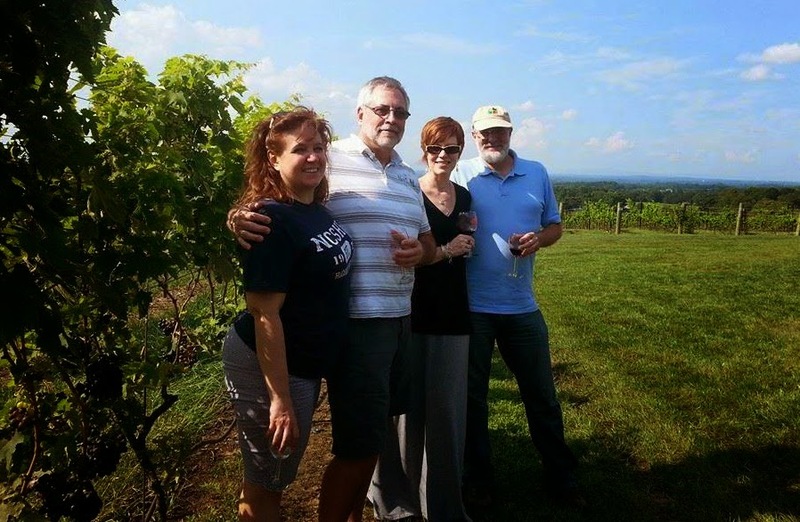 On Saturday, Kimberly and I joined up with our friends Terry and Beth Nelson to visit a few wineries out in the Yadkin Valley. 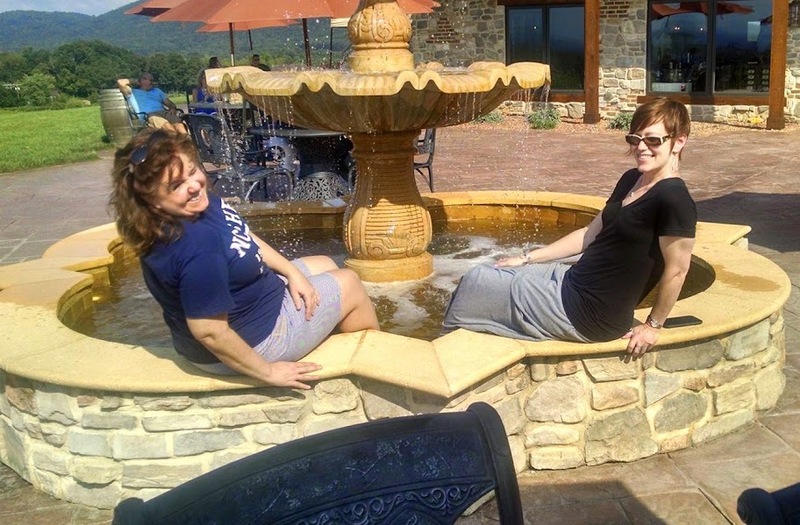 The weather was hot, muggy, and downright uncomfortable, but since there was wine involved — some of it quite good indeed — we forced ourselves to make the best of it. On Sunday, after the geocaching event, several of us went to The Celtic Fringe, a superb little pub in Reidsville. And for afters, Peter Jackson's Bad Taste was on the menu, and it's really bad, but in the best possible way. On top of it all, I managed to finish up my most recent work of short fiction, titled "Red Rage," so it's ready to go off to the editor of the anthology who requested it. So now it's back to the grind, and boy, there's some serious grinding going on. Throw them into the cooler! The women chillin' at Raffaldini.